You physically feel your life being sucked right into my voodoo doll and theres no escape after that… You wont even want to escape because My power is so dark and intoxicating and it feels good to be totally controlled in my voodoo doll. – even though you know this is real and will leave you under my power forever until I release you only with pay and knowing… this is such a rush and you cant resist – you WANT to be bound and then trampled on with my high heels… you want to get a head rush while I mind enchant you and control you by my voodoo doll… its too hot to resist. Real but so irresistible. 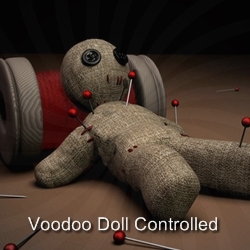 Want a new life inside my voodoo doll? watch this!Watch now / be voodoo controlled instantly!